My gosh Bueno and Fernandez execute some wonderful art in this issue. I have loved every issue of Justice League Dark so far, but this one is exceptional when it comes to the visuals. I am always a sucker for a crowded scene in which the identities of those packing the panel are able to be determined. And I love the Oblivion Bar. Put those two together, and the artists give us a jammed location filled with easily (and not so easily) identifiable magical characters. 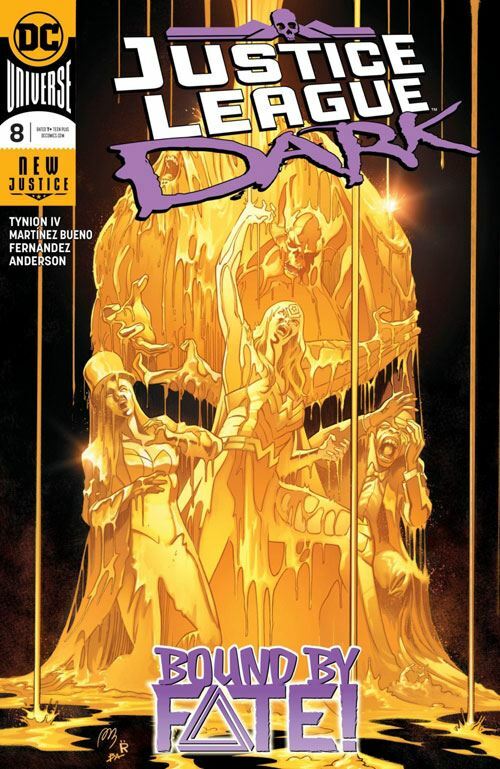 Plot wise, this issue brings the Demon to the bar, and has Zatanna pay a visit to Papa Midnight’s club. Man-Bat puts his efforts towards freeing Khalid Nassour from the urn that Dr Fate sealed him into. In other words, this is, when it comes down to it, a lot of set up, world building, and preparation for what is to come. In a lot of cases, that makes for a fairly pedestrian issue. In Tynion’s hands, we are provided with a highly entertaining story. Just because the main purpose of the issue is to lay groundwork does not mean it has to be a tale of lesser enjoyment. I think this issue is a testament to how a very good writer can overcome the limitations of storytelling that the chapter-by-chapter nature of comic books requires. And the fanboy inside me was so thrilled with the scenes along the way. The Swamp Thing vs the Demon moment, even if it got cut short, really stood out. This is, by far, the best magic team book that DC has released. And I was a big fan of Shadowpact, so that’s saying something.